Byrant Hand, 33, professional educator and entrepreneur, came to Guatemala four years ago and founded the Oxford Language Schools which currently train Spanish speakers in 28 languages ranging from Korean and Mandarin to Portuguese and English. The schools are a successful business, catering largely to adults and corporate clients, but Bryant, who had seen what he calls the “transformative power of language education” wanted to put his talents to use for underprivileged children in his host country. With these kids in mind, he founded Las Manos de Christine. Las Manos de Christine is a non-profit organization, named in honor of Bryant’s mother, an educator who dedicated her life to her family and her students. The goal of Las Manos de Christine is to provide the same world-class language instruction to the poorest children in Guatemala that the Oxford Language schools provide to Central America’s business class. Through both his for profit and non-profit work, Bryant knows that the level of proficiency a Guatemalan has in a second or third language, particularly English, is directly related to the success they will achieve in their professional lives. And he knows that the Guatemalan economy of the coming decades, increasingly global and increasingly based on tourism, will reward today’s children who have the opportunity to integrate with that new economy. He is determined to see that the less well off are not left behind again. But identifying the problem isn’t solving it. The barriers to providing quality language instruction to the impoverished children of Guatemala are immense. The public education system is bureaucratic, underfunded and unwelcoming of outsiders, the private schools don’t serve the target population, and volunteer projects generally are not structured in a way that would make intensive language instruction a viable option. To surmount these obstacles Las Manos de Christine formed a partnership with Camino Seguro/Safe Passage, a NGO which provides educational, medical and nutritional support to children whose families work on the Guatemala City dump. The philosophy of Las Manos de Christine is that for real learning to occur, students need a safe environment with professional language teachers willing to engage them in a long term educational commitment. Las Manos de Christine has the teachers and the educational resources. Camino Seguro has the children, the will, and the facilities. Together, they are building a successful future for hundreds of children that much of the rest of the world would rather simply forget. For the past year, together, Camino Seguro and Las Manos de Christine have brought the disparate parts of the educational puzzle together and created a real solution for an endemic problem – and in the coming years, Las Manos de Christine is committed to building similar world-class ESL programs for impoverished students across Guatemala and Central America. To reach these goals, Las Manos de Christine needs to continually raise resources. Initially, Bryant Hand went to his family and friends for donations to begin building towards this inspiring dream. To continue their growth and development, they are constantly searching for new sources of revenue. One intriguing resource that Bryant and Las Manos de Christine has tapped is bringing together the arts community in Guatemala with those willing to donate time, effort and money to support their program. On October 8, 2008 Las Manos de Christine will be hosting an art opening and auction at Meson Panza Verde in Antigua. At this event, which is sure to be a success, the work of over 20 Guatemalan artists – as well as the artwork of many of the children of Camino Seguro – will be on display in the Panza Verde Gallery. Please come and join with Byrant, his teachers and his friends as they continue to work for the poorest children of Guatemala on their quest to build better lives through education. Wine and refreshments will be served for the opening on the evening of October 8. The exhibit will remain open for public viewing and bidding through out the month of October. Panza Verde is located at #19, 5th Avenida Sur. To learn more about Las Manos de Christine, please visit their website: http://www.lasmanosdc.org. 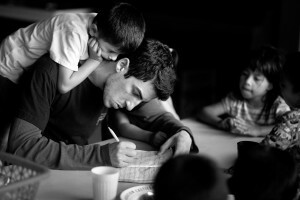 To learn more about Camino Seguro/Safe Passage, visit their website at www.safepassage.org. Lo que aún no te hemos contado es la experiencia que supone un viaje en conjunto de estas peculiaridades.